A number of gardeners comment on how the soil in Milton Parish appears to be a few inches of decent top soil and the rest is just clay. This makes digging extremely hard work. However that clay provided quite a large amount of work in and around the town at the turn of the last century. The clay is of great value in the making of bricks. 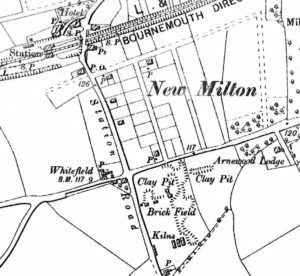 When New Milton first came into existence in 1886 with the construction of the railway line and the station, it was commonplace to see clay pits, kilns and brickworks in and around our area. 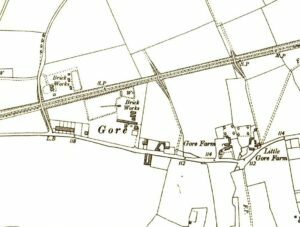 Have a look at this section of an 1898 Ordnance Survey map. It clearly shows clay pits situation roughly in the area of where Boots the Chemist and the Town Hall are currently located. The brick fields, where stacks of bricks would be laid out prior to and after being fired in the kiln, was situated in the area of where the Co-Op supermarket is now. The Kilns were further south along Station Road roughly in the area opposite Bradbeers department store where the Craft Shops are situated. The clay was extracted from the ground and pressed into wooden moulds. The pressed brick shaped piece of clay was removed from the mould laid out on the brick fields to dry out. They were then placed in a kiln and fired. 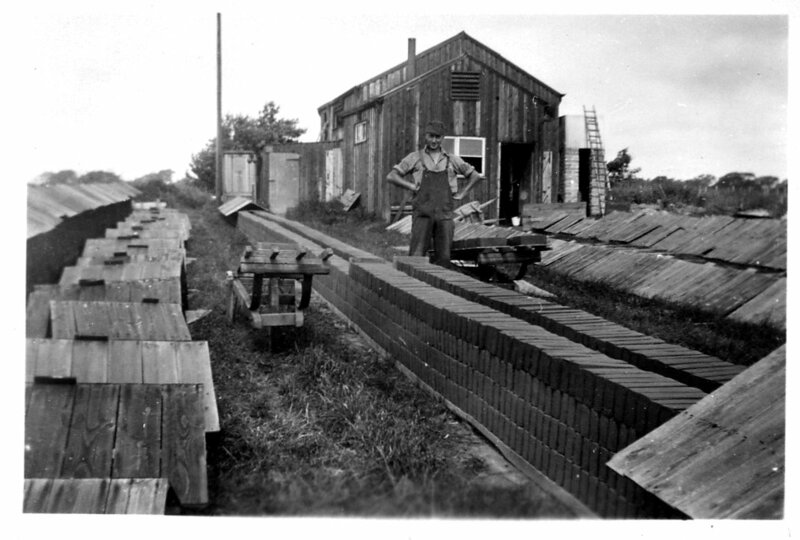 The baked bricks would be then be stacked to cool off and await shipping. The darker bricks come from the centre of the kiln and the lighter, more orange colour ones are from the outer part of the kiln. 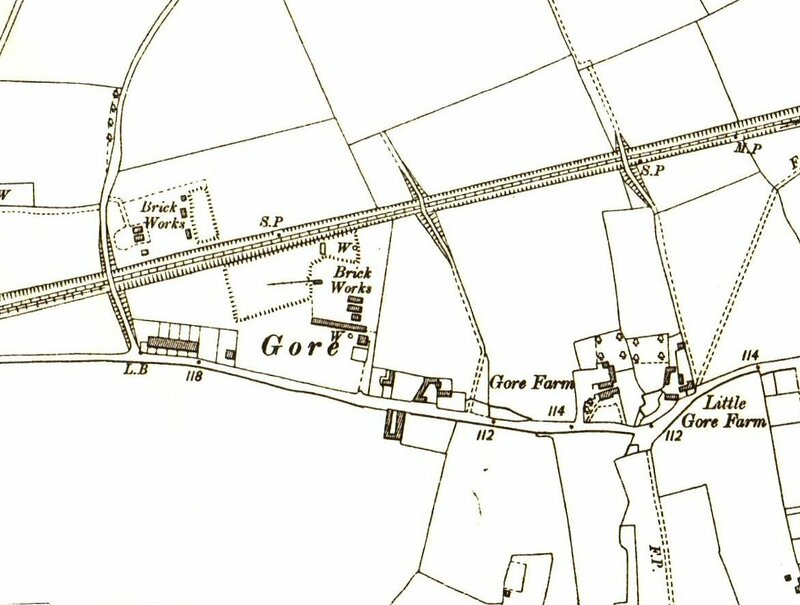 One of the biggest brick works in New Milton was situated in Gore Road near to the junction with Stem Lane. Have a look at this section of a 1909 map. You can see quite extensive works in the area roughly where Jewson’s builders merchants is now situated. 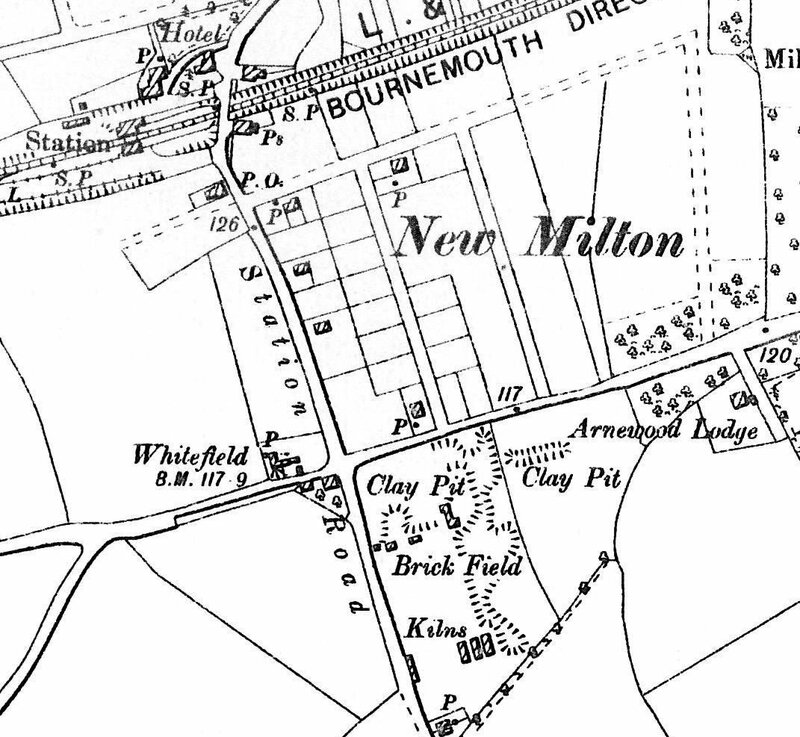 The Milton Brick Company works were to be found in Stem Lane just over the railway bridge in the area where the entrance to the modern day Industrial Estate is located. Their bricks were identified with MBC embossed in the frog or indented area of the brick. 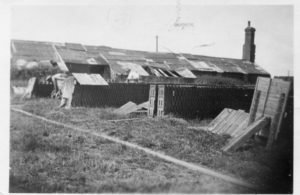 As well as the brickworks and kiln in the Spencer Road and Station Road area there was another situated at Andrews Lane in Ashley. There were three brickworks in Hordle. 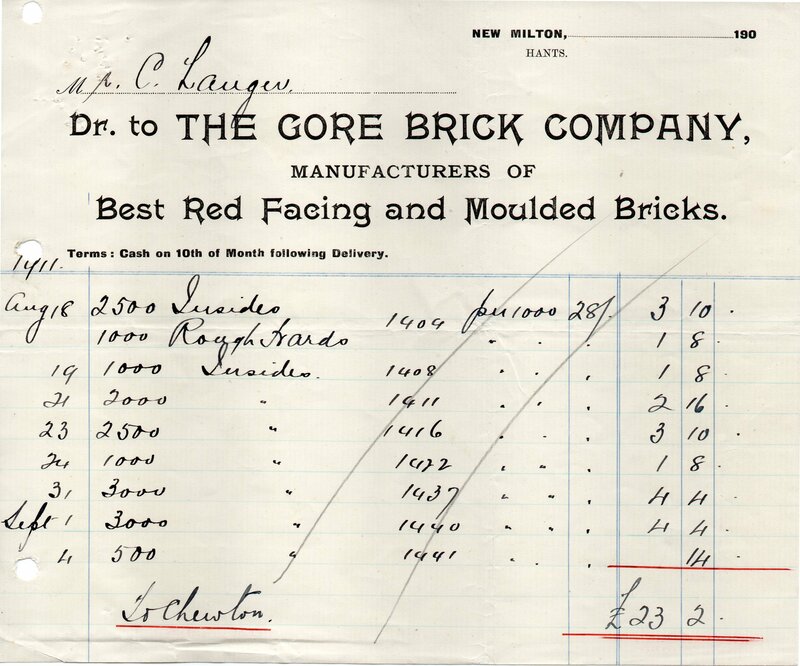 The Gore Brick Company was a fairly large concern which produced hundreds of thousands of bricks in its time. 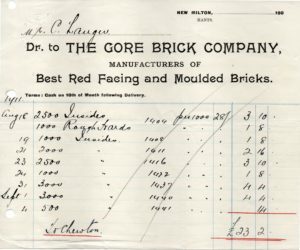 Have a look at this bill from the company dated 1911 which shows how many bricks they were sending out in one shipment and how much they were charging. Bricks from Milton were being sent out to other areas of the country via the railway being used to help construct towns such as Bournemouth for example. These images give some idea of the scale of the brickworks. The picture shows Walter James Legg stood by stacks of moulded clay awaiting firing. Walter was able to obtain part time and seasonal work at the Gore Road Kiln. The work was seasonal because it was nearly impossible to continue operating in the winter. Frost would damage the clay brick moulds prior to firing. Note the wooden covers being put over the moulded clay to stop the weather damaging them before they go in the kiln. This image gives a further view of the site. The demise of the local brick works came between the wars when demand outstripped their ability to supply hand-made bricks. Automation and bigger works meant that the local companies in Milton and Ashley could no longer profitably compete especially as the works in Milton effectively shut down during the winter months. .
Next time you are gardening and feeling the strain from digging clay give a thought to those Miltonians who made a living out of that clay in the many local brick works. If you own an old house in the area and have alterations look out for ‘MBC’ embossed in the bricks.